Sydney FC was once infamously dubbed the Manchester United of the A-League. As the fourth manager of the club heads out the door, I'm inclined to think of it rather as the Real Madrid of the A-League, given the coaching merry-go-round that the fans have had to endure season after season. It was perhaps inevitable that Kosmina would be a casualty of the regime change at the club, and some of the fans will undoubtedly be celebrating. I can't quite share the joy. Whatever the luck he enjoyed in 2007/08, including two soft opposition red cards in successive weeks (against Central Coast and Adelaide), the fact remains that Kosmina dragged the team from the bottom half of the ladder to within a victory of the Premiers' Plate. In 2008/09, he had the side playing some good football until John Aloisi was awkwardly slotted in, the injuries mounted, the defence became a wreck, and several players lost form. The blame for some of this can be laid at his door. But not all of it. You name me one coach in the A-League who hasn't had a difficult time. It is difficult to run a successful organisation and plan for it if you are making those changes so frequently. Culina, like his successor, was the subject of cutting second-hand criticism towards the end of his tenure. And it is this phenomenon of constant innuendo issuing from the dressing-room which leads me to think that the real problems with Sydney FC (from an on-field point of view) do not centre around the man in the (track-)suit. Terry Butcher left after persistent suggestions in the press that he was a tactical idiot with a laughably outdated approach to coaching. The ultimate source of these grumbles? The players. Branko Culina was accused of confusing the team with rambling dissertations about tactics, and of being unable to express his wishes at all clearly. The source? The players again. Now, we hear that John Kosmina has been undermining the players in public (an unfair criticism, in my view), and that he has alienated the dressing-room with his bullying methods (slightly easier to believe). The source of these revelations? Naturally, the players. Whoever steps into the hot seat would be well advised to watch their back. And who should it be? Brian Brown has certainly shown his credentials at state league level in recent years, but he may not be inclined to endure the extra travelling and pressure involved. Should Graham Arnold even be mooted for the post, you can expect mutiny on the streets. The obvious choice at the time of Culina's dismissal, Aytek Genc, has become the latest incumbent at another club with a revolving-door coaching policy, namely Sydney Olympic. The two overseas coaches used by Sydney FC so far have been relatively unimpressive, but it wouldn't be a surprise if the new owners opted for a foreign recruit. They should exercise extreme caution, however, given the track record of ring-in coaches in the A-League. The lucrative transfer of Nikita Rukavytsya to Holland's FC Twente constitutes a fantastic bit of business for Perth Glory, and an exciting opportunity for the talented striker. It was fitting that Rukavytsya signed off in the A-League with one of the finest goals he has scored in the competition, an impressive display of close control (an aspect of his game which has improved markedly) and precise finishing against Queensland. Yet within that goal there were signs of the deficiencies which he will probably need to iron out if he is to become a fixture in Europe. Receiving the ball somewhat awkwardly with his left foot in the area, he danced neatly around four Queensland defenders before firing a tremendous shot inside the far post. Yet, as has already been mentioned, he may not have had to skip past the crowd of Queensland players at all had he received and shot with his right foot. Shortly afterwards, there was a revealing moment when Rukavytsya was forced to shoot with his right peg, and a weak, snatched shot was the result. Pim Verbeek's comments about the one-footedness of Australian players are pertinent once again. Yet there is a great deal to like about Rukavytsya, whom I've long considered one of the most exciting young talents in the league. It is not only his pace which marks him out as a player for opposition defences to fear, but his infectious confidence, his willingness to run at a defence. Few other strikers in the Australian game are so keen to take on a centre-half. His finishing, too, shows great promise. He is undoubtedly at his best with a striker of the target-man variety beside him; this season, the imposing Eugene Dadi has been an excellent foil. When paired with another "runner", as he was with Archie Thompson at the Olympics, Rukavytsya loses a great deal of his effectiveness. As a matter of fact, he appeared so short of confidence in China that one wondered whether he would be able to slip back into his erstwhile groove with Perth. No problems at all. And this resilience could be a solid asset on his European adventure. The Shed will miss him, and the gap in the strikeforce will have to be filled pretty quickly, but the reported transfer figure will be a godsend for a club whose finances have been in such a parlous state over the last few years that there was even talk of the franchise being withdrawn. Now, things are looking considerably rosier. During my stint masquerading as a football journalist, I had the chance to meet Craig Foster, who (as alert readers may remember) has featured once or twice on this blog. Not entirely to my surprise, he was affable, articulate and generous with his time in person. Sadly, many of his pieces in the Sun-Herald are still as facile and disingenuous as ever. In his latest diatribe, he has joined the chorus of boos directed at John Kosmina. It is hard for me to defend Kosmina, about whom there is plenty to dislike...not least his bullying attitude towards the media and, occasionally, the fans. But the charges being levelled at Kosmina lately frequently gloss over the various problems he has encountered this season which were not of his own making (for a description of which, by the way, see here). This, in my view, is an attitude that has poisoned Sydney FC for far too long. The idea that being the team in the biggest market demands a glamorous image has led to poor decisions in many areas, recruitment in particular. Surely a better attitude is simply that the team should be playing football that is worth watching. Sweeping generalizations are a Foster specialty, and as usual, this one is well off the mark. It does not apply to, for instance, Ivan Necevski, Shannon Cole, Alex Brosque, Terry McFlynn, Brendan Gan, and arguably half a dozen others. I yield to none in my admiration for Corica and all he has done for the club, but in all honesty age has been catching up to him with a vengeance this term. And this is a pattern that has been discernible for quite some time: after a few good games at the start of the season, Corica fades towards the close. To implicitly blame Kosmina for Corica running predictably out of legs is most unfair, in my view. Even, erm, Branko Culina, Nick Theodorakopoulos, Zoran Matic, and some of the others that the SBS team have tried to talk up for A-League gigs over the years? [A-League coaches] might turn up every day and get paid as professionals, but as I see it, their knowledge is amateur, their training is amateur and their tactics limited. Again, the players know it. This is extremely disrespectful, especially from someone with no significant coaching experience of his own. Again, assumption wins out every time. And let's just ponder that mention of the players for a moment. One of the main beliefs underpinning most of the SBS opinion pieces is that the players are never to blame, which is often a dangerously misguided view. In the case of Sydney FC, a pattern is emerging: a new coach arrives, there are rumours of "senior players" expressing their dissatisfaction with his tactics and selection, these rumours reach certain opinion-mongers, and soon there is widespread excoriation of the coach (and sympathy for those poor senior players). Some of the senior players at Sydney FC appear to consider themselves too good for any coach that comes in, and one or two of them need a serious look in the mirror at the moment. I refer particularly to one member of this clique, who has made a habit of muttering behind the scenes to journalists and even fans about the inadequacies of the current coaching incumbent...while, this season in particular, displaying dreadful form himself. Having said all this, the constant braying in support of Kosmina by the usual Fox suspects is often just as distasteful. But Kosmina doesn't deserve such belittling. The above could serve as a glass-half-full summary of Wellington Phoenix's season, which ended tonight with a scrappy 2-0 defeat at the hands of Melbourne. There were plenty of good signs from the Kiwis this term, for which they can thank, among other things, their canny recruitment. Jon McKain and Andrew Durante were excellent buys, and Manny Muscat, a state leaguer, proved (like Shannon Cole and Pedj Bojic, among others) that the step up to the A-League is not at steep as some like to pretend. If there was one main factor which prevented them from breaking into the top four, it was surely Shane Smeltz's sad dip in form towards the end of the season. He looked listless and short of ideas in the pivotal 1-0 loss to Sydney FC two weeks ago, and failed to recover his earlier brio in the final two games. An injury to Durante (one of the most under-rated players in the league) didn't help either, while Tim Brown's sendoff against Adelaide necessitated the use of the habitually inadequate Michael Ferrante in the engine-room against Melbourne. The Phoenix faced their share of difficulties during the season, including the thorny Leilei Gao "situation" and the handicap of not having any youth troops to draw upon (this is an issue which the FFA will need to address in future seasons, I feel). But they have built a solid supporter base by now, and they have achieved their aim of maintaining a good complement of local players. So, to the future. Glen Moss will be sadly missed in goal, but at least his understudy Mark Paston, who has often been impressive when given the chance, is still there. With the departure of both Vaughan Coveny and Smeltz, the first items on Ricki Herbert's shopping list should be two decent strikers; Costa Barbarouses has been lively but very raw, and needs a "focal" player next to him. The midfield looks healthy enough, with Brown, McKain, Leo Bertos and Daniel - inconsistent but occasionally incisive - all in the mix for 2009/10. One last issue: the infamous comments from Mohammed bin Hammam on the New Zealand side's continued existence in the A-League caused more of a fuss than they really should have, given that his initial remarks were in the nature of an afterthought, and were swiftly contradicted by Sepp Blatter. There are plenty of good reasons why the Phoenix should stay in the league, and having visited Wellington recently I can attest to the enthusiasm of the locals for the game. And the stadium, in stark contrast to the Knights' distant home in Auckland, is ideally situated. The Socceroo squad for the Asian Cup qualifier against Indonesia has been announced, and it looks a fairly good one on balance. Pim Verbeek's decision to favour club partnerships in attack makes sense. Certainly Archie Thompson and Danny Allsopp showed all their old understanding in the latter stages of Friday's game again the Mariners, who have also provided the group with a striking pairing. Although Dylan McAllister has gone off the boil a little, Matt Simon's selection is expected and pleasing. Simon has surprised many. When he first turned out for the Mariners, he looked physically imposing but technically very poor, often squandering opportunities in front of goal with wretched first touches. But he has clearly worked on this aspect of his game, and has matured into one of the most dangerous strikers in the domestic game. His physical, aggressive style has already brought some success against Asian defences, too. Joel Griffiths was perhaps a bit unlucky to miss out on a striking spot, but he hasn't quite regained peak form since his injury. It is a shame that Nikita Rukavytsya is otherwise engaged in Holland, but the attack should still have enough pace to worry the Indonesians at times. It's difficult to identify a true leader in midfield (Mile Jedinak would surely have been the first name on the list but for his move to Turkey), but with Paul Reid, Matt McKay and Matt Thompson in the mix, there is enough grit and nous in the engine-room. Travis Dodd must consider himself very unfortunate to miss out, however, especially given that the squad is otherwise short of players who can operate effectively on the right. Shannon Cole is a strange choice at first glance, but perhaps Verbeek has been impressed by his dead-ball prowess; he might offer an alternative to Reid in that department, in positions that would favour a delivery with the left foot. Sasa Ognenovski's decision to throw in his lot with Macedonia is disappointing, but a centre-half pairing of Craig Moore and Roddy Vargas looks solid enough. The selection of Robbie Cornthwaite and Nikolai Topor-Stanley as understudies is bizarre, though; both are capable in the air but very ordinary otherwise (Cornthwaite hasn't earned his nickname of "The Shin" for nothing). More worthy candidates, in my view, would have been Andrew Durante (who has, admittedly, suffered from hamstring trouble lately), or even Luke DeVere. Looking further ahead, it's interesting that Verbeek has singled out Scott Jamieson for praise ahead of the game. For all the A-League's achievements, none of the players "nursed" in the new domestic league has looked a certain future Socceroo regular, but with Scott Chipperfield on the wane and David Carney still not quite adequate defensively, Jamieson could indeed play an important role in the future, in what has been a problem position for the Socceroos whenever Chipperfield has been away. In the few games he has officiated in the A-League, young Chris Beath has shown very promising signs. Unlike many of the other referees in the competition, he is genuinely unafraid of punshing violent play, and has been fairly consistent overall. However, in this afternoon's match in Wellington he fell into a trap that snares plenty of refs: the temptation to go easy on a home side when one critical, game-changing call has gone against them. In the current case, that call was the dismissal of Wellington's captain Tim Brown for a second cautionable offence. Although the first yellow card (given in the first half) was a little harsh, there was absolutely no doubt about the second, which Brown earned by cynically impeding Adelaide's captain Travis Dodd as the latter surged forward on the counter. But to send a captain off before a home crowd earns you a fair bit of heckling, and Beath adopted a conciliatory attitude for the rest of the game. His change of heart was clear only a minute later, when Leo Bertos, also booked in the first period, blatantly body-checked Dodd on another Adelaide breakaway. It was, very clearly, an offence worthy of a card...which would have reduced Wellington to nine. Yet Bertos received nothing more than a talking-to. No, folks, that is not common-sense refereeing (as the commentators often glibly observe). It's inconsistency. And, sadly, it continued thereafter. Daniel, never averse to a bit of gamesmanship, deliberately handled the ball on another Adelaide break, and then kept hold of the ball following Beath's whistle, to prevent Adelaide from taking the free kick quickly. Again, a yellow card was richly deserved. Again, Beath did nothing. Finally, a few minutes before the end, Scott Jamieson was the victim of a classic "professional foul" from Manny Muscat on the edge of the Wellington area. Still no card. To reiterate, Beath appears a promising young ref. But he, like the rest of the "panel", has to be careful of becoming overly indulgent with a home side once they have suffered a nasty blow. They deserve no special favours as a result. Watching the Central Coast Mariners' last two games, I've gotten the strong impression that the wheels are simply falling off. An obvious factor in the downturn has been the departure of Mile Jedinak, but the problems run a little deeper than that. Certainly, Jedinak's replacements in the engine room have simply not measured up, and Brad Porter in particular has looked very vulnerable in the centre of the park. It was a considerable surprise last week when Lawrie McKinna decided to replace Matt Osman at the break, who had done rather better than his two colleagues in midfield up to that point. In the second half, the Mariners' midfield was brutally overrun. And once the floodgates had been opened tonight, the collapse of the Central Coast midfield was abject. It was strange that in the first game following Jedinak's departure, McKinna reverted to his top-heavy 4-3-3 formation, rather than strengthening the midfield to make up for the absence of his imposing anchorman. Again, in Melbourne, three strikers started, all vying for the regular long balls. And although Andre Gumprecht worked some openings on the right, the midfield was short of both strength and craft. For the latter, see Mr. Adrian Caceres. The former is more of a problem given the Mariners' roster, but perhaps it would have made more sense for Gumprecht to have been used centrally, with Porter shifting wide. But there are issues in other areas as well. Nik Mrdja has lost confidence, Dylan McAllister no longer gets involved enough, and Matt Simon cannot be counted on to save the day every time. At the other end of the park, Alex Wilkinson and Pedj Bojic have shown some frailties that have been largely hidden up to now, Bojic in particular being embarrassed by Archie Thompson on the occasion of Melbourne's third. Will the Mariners drop out of the four? Wellington and, surprisingly, Sydney are still in contention, but McKinna's men can probably hang on. Facing Adelaide next week may be a blessing in disguise, as Aurelio Vidmar's team finally look like the fixture crush is catching up with them. The Mariners don't look in the best of shape for the Asian Champions League, however. Their physical style is likely to attract far more cards than it does in the A-League, and although the tall timber up front will intimidate some Asian defences, such a strategy can only be successful up to a point. At the very least, they need to acquire a temporary successor to Jedinak before the Asian rigours kick in. As for Melbourne, it barely needs pointing out how much better they looked once Carlos Hernandez arrived. The schemers of the A-League have been shunned at times this season, unfortunately, and one hopes that Hernandez will cement a starting spot in time for the finals. And can Archie Thompson, the ultimate confidence player, finally spark himself into form on the back of his brilliant final twenty minutes this evening? The final of the 1966 World Cup was a dramatic, enjoyable match, rich in turning points and subtle shifts of the initiative, yet all that most fans seem to remember about it these days is England’s third goal – the one that “didn’t cross the line”. So let’s deal with that little matter first. Even with a slow-motion replay, let alone with the naked eye, it’s impossible to give a definitive answer. One could argue that the Russian linesman, Bakhramov, was wrong to uphold the goal given the doubt that must have existed. There is, however, a feature of the goal that is hardly ever touched on: Roger Hunt, not offside, was moving into the six-yard area as Geoff Hurst took his fateful shot, and could probably have applied the finishing touch had he wanted to. Instead, he immediately turned around and began celebrating, clearly certain that the goal would stand. Foolish on his part, perhaps, but a point worth remembering. But enough on that. What of the rest of the game? In my view, Germany lost the game largely because Franz Beckenbauer was sacrificed to the job of shadowing Bobby Charlton. After his two goals in the semi-final, it’s understandable that German coach Helmut Schoen was keen to keep a close watch on Charlton. But Beckenbauer, who looks dangerous every single time he moves into attack, was surely not the right man to do it. If Schoen had deployed an extra man in midfield, allowing Beckenbauer to get forward, and perhaps jettisoned the ineffectual left-winger Lothar Emmerich instead, I’m inclined to think that the Germans could have won the game. In most respects, they look the better side. The game begins with an early goal apiece. Helmut Haller finishes neatly after a weak clearing header from England’s left-back Ray Wilson, and then Geoff Hurst scores with a deft header from Bobby Moore’s free kick. For much of the rest of the game, England look prosaic in midfield, compared to Germany’s classy trio of Beckenbauer, Haller and Wolfgang Overath. Charlton is a nonentity on this occasion, Alan Ball doesn’t come to life until the second period, and Martin Peters, a sort of early exponent of total football (like Ball), never really gets a grip on the game. Having said that, it’s Peters who volleys home England’s second, twelve minutes from the end. Charlton finally breaks free of Beckenbauer a few minutes from time, latching onto a pass from Hunt, but makes a dreadful hash of his shot. Germany then score a messy goal from a free kick, and it’s extra time. By this time Schoen has made an interesting tactical switch: Siggi Held, the centre-forward, has started moving over to the left. And on one occasion, in the first period of extra time, it looks like bearing fruit: Held goes on a tremendous run down the flank, and could easily have gone down for a penalty under a late challenge by Jackie Charlton. Instead, he stays on his feet, makes his way nimbly to the by-line and cuts the ball back sharply…to no-one. After England score the controversial goal a few minutes later, the Germans never really look like coming back into it, although Held is unlucky to be called back for a foul on another promising left-wing incursion. In the last minute, a long ball from Bobby Moore sends Hurst through on the left, Overath is too exhausted to reel him in, and a thumping left-foot shot beats the German keeper Hans Tilkowski at his near post. So, to return to my general assessment: if England weren’t the best side in 1966, who deserves that accolade? Hardly the Germans, whose opponents were reduced to nine men in both of their prior knockout games. The Portuguese? Perhaps, despite their defeat by the eventual champions. Theirs was an exciting team, a little weak in defence, but a powerhouse in attack, mainly thanks to Eusebio. I’m tempted to vote for Hungary, a couple of whose games at the event I’ve been able to watch. They were very unlucky to lose to a bruising, hard-running Russian side in the quarter-finals, and they played magnificently to beat Brazil in the opening round. In the end, though, England faced testing opposition in the knockout phase and made it through. They had slices of luck in terms of decisions, but the massive bias of legend is hardly there. Not one of the World Cup’s truly great teams, but legitimate champions. The story of England's sole World Cup triumph continues. Their semi-final against Portugal is one of the best World Cup matches I've seen. Fiercely (yet fairly) contested, in the balance right until the end, and full of drama and fine football. Once again, England were the poorer side on balance...but they won a couple of crucial individual battles, and one mildly suspicious decision near the end also aided the English cause. It's worth considering the contrast in the two sides' quarter-final fortunes. England had won a dour, violent game against Argentina, while Portugal had contested a thrilling match against surprise packets North Korea, coming back from three goals down to overwhelm the Asian side, who tired and lost their self-belief in the second half. Ostensibly, then, Portugal should have been on a high, while one would expect the English to have experienced some self-doubt after a fairly hollow victory. Yet it was Alf Ramsey's side that came out of the blocks more quickly, attacking vigorously in the opening minutes, although a half-chance for Geoff Hurst was all they had to show for it. Portugal were displaying the greater craft in midfield, but the ultimate target of most of their moves was the head of the tall forward Jose Torres...and thereby hangs a tale. When accounts of this game are given in the history books, much is made of the nullifying of Eusebio by the tenacious Nobby Stiles. Yet the real key battle of the game was not this one (which Eusebio, incidentally, managed to get the better of later in the match), but the aerial clash between Torres and England's centre-half, Jackie Charlton. Charlton has the beating of Torres in the air nine times out of ten, and it is this dominance which prevents the Portuguese from really making headway in the final third, since their strategy of utilising Torres' height and strength rarely varies. England score their first after half an hour, Bobby Charlton slamming home a rebound after some fine lead-up work by Roger Hunt. The momentum is with England for the next few minutes, but then Portugal start to take over. Eusebio begins to shake off the attentions of Stiles, bringing others into play by drawing ever more defenders to him. The Benfica star has a shot himself just before the break, which forces an excellent save from Gordon Banks. The second half continues in similar vein, with Portugal dominating possession but Jackie Charlton standing magnificently firm in defence against Torres, who is still the magnet for Portugal's moves. Eventually, England pull themselves back into the game, and score a second on 79 minutes, when Hurst forces his way to the by-line and prods the ball back for Bobby Charlton to thump home his second. The initiative is still with the Portuguese, though, and on 82 minutes Torres finally eludes the other Charlton to win a header in the box, which his marker then handles. Eusebio whacks in the penalty, and it's game on once again. And something strange starts happening: now Torres wins the aerial challenges! Including one that might have been pivotal, a couple of minutes after the goal, when he nods a cross down for the advancing Antonio Simoes, who is only prevented from shooting by an incredible last-ditch tackle from Stiles. Torres wins another header a minute later, which reaches the Portuguese captain Mario Coluna. He sends a backward header at goal, which is...clearly handled by Bobby Moore in the box. In the recording I've downloaded, which has Spanish commentary (many, many years after the event), the "expert" commentator, who happens to be English, says "It looks unintentional to me." I beg to differ. Yet the referee waves play on. Portugal have one more chance, when Coluna beats a tired Martin Peters on the right and sends a searing cross-shot at goal, which Banks saves superbly. 2-1 it finishes, a great game of football. And again: one potentially important home-town call, but that's it. Pretty meagre evidence for a conspiracy. Last but not least, the final against West Germany. Coming soon to a blog near you. Plenty of people, myself included, have agonized about various aspects of the A-League this season; some constructively, others (mostly on the payroll of a certain R. Murdoch) from a sense of sheer spite. To be sure, the competition faces its share of problems. But it’s always good to be reminded occasionally, as I was last night at Bluetongue Stadium, that the league is basically in rude health. A passionate and (despite the “new dawners” cliché) quite knowledgeable crowd of 11,000-odd watched a tremendously entertaining game of football, on a good pitch, in a pleasant, comfortable stadium. There was plenty of young talent on show to enthuse the spectators; Queensland’s two young wingers, especially the mercurial Tahj Minniecon, had a field day tormenting the opposing fullbacks, while a local youngster who is quickly becoming a cult figure on the Central Coast scored two goals at the other end. There was also an imported player turning in a fine performance, perhaps an indication that the clubs are beginning to exercise some discernment in their recruitment of foreign players. Two “returning Socceroos” played key roles in the victory of the away side, and for many of the older fans they provide a comforting link between the past and the future of Australian football. Another small point: contrary to the stereotype, there were a fair few players in the “peak range” – the early-to-mid-twenties age group – on display as well; Matt McKay, Massimo Murdocca, Matthew Osman, Dylan McAllister, Pedj Bojic, etc. Last but not least, the general ground organization was impeccable, the police presence discreet, and the interplay between the fans never more than superficially hostile. Admittedly, the match in question was between two of the most stable and well-run clubs in the competition. But the mere fact that an occasion like last night is now taken for granted is a sure token of how far the league has come in such a comparatively short time. “Could you have imagined this, just a few years ago?” remarked a journalist I was chatting with just prior to kick-off. There was only one possible reply. Watching yet another eager but painfully disjointed performance from the Newcastle Jets last night, it was hard not to feel that this was a team of kids playing among men. Gary van Egmond has had a hard time with injuries, of course, exacerbated by a number of boardroom blunders. But the Jesse Pinto substitution towards the end of the game, within minutes of his arrival, suggested that things really have gone off the rails. And it was the appearance of Pinto that reminded me why the scene - a young team thrashing around with no real cohesion, and no idea of how to break down a determined opposition - looked so familiar. This was the Blacktown City Demons, in the 2008 NSW state league, all over again. A bit of background. Following their 2007 title success, almost Blacktown's entire first eleven jumped ship, partly due to the departure of coach Aytek Genc to Sydney FC. Due to financial problems, the Blacktown team that took part in the 2008 competition was virtually a youth team (including, incidentally, one Jesse Pinto). And they flopped. They often played some nice football, individually. A couple of their players gained plaudits from the NSWPL great and good. But as a team, they looked callow. There was no-one to take control in midfield, no-one to really orchestrate the attacks. A classic case in point was their 4-0 loss to Manly United at home, when they probably had most of the possession, and definitely played the more "pretty" football, but were undone by the clever, experienced Robbie Cattanach on many occasions. Last night, of course, Newcastle were undone (initially, at least) by a gem of a goal from Fabian Barbiero. And that brings me to the real point of this piece. One of the effects of the new National Youth League has been to oblige the A-League teams (Wellington excepted, of course) to dip into the youth squad for replacements in case of injuries and suspensions. The hope was, presumably, that some youthful stars might blossom when exposed to proper professional football. It was a reasonable hope. But has it hamstrung the clubs a little, in comparison with previous seasons? Before now, clubs have been able to sign players onto short-term contracts from the state leagues (or, more generally, elsewhere) to fill up the squad when the treatment table starts becoming crowded. Players like Fabian Barbiero, in fact, who was plucked from the South Australian state league to become one of Adelaide's most consistent players. Sometimes, admittedly, these short-term wonders have been flops. But at other times, they have provided some important nous and experience at a vital period of the season. The short-term contract business was certainly cumbersome, and one could argue that the youth league "option" has rid the A-League of a lot of red tape. But in the case of Newcastle, and to a lesser extent Sydney FC, one could also argue that the change has led to the team relying on kids at a critical stage of the season. Nice from a broader developmental point of view, but I'm not sure how the clubs feel about it right now. During my blogging sabbatical, I continued avidly downloading some of the finest World Cup games of yesteryear, and have now been able to form a clearer picture of one victorious team in particular, whose triumph was always considered somewhat tainted. Namely, the England team of 1966. Even beyond the usual “did it cross the line” clichés, there has always been a whiff of suspicion about a few home-town calls favouring Bobby Moore and Co. (as with the Argentinians of 1978, whose “suspicious” penultimate game I’ve described in detail earlier). I was interested to see whether the oft-repeated claims of illegitimacy levelled at Sir Alf Ramsey’s side had any foundation. And now, after a fair bit of viewing and reflection, I’ve come to the conclusion that they were, in fact, legitimate champions…but perhaps not worthy ones. By that, I mean that they were almost certainly not the best side in the tournament, despite winning the event. They looked the poorer team in every one of their three knockout matches, but overcame their technical limitations with grit, teamwork and a little luck. But was it a conspiracy? Probably not. They were indeed lucky to be placed in by far the weakest first-round group, with long-time easybeats Mexico, a French side who hadn’t yet come close to replacing Fontaine and Kopa, and Uruguay, who were resilient and organized rather than brilliant. England passed through the opening stage with little trouble, despite an injury to star striker Jimmy Greaves. And so to the knockout stage, where the controversies really begin. The quarter-final against Argentina has long been a bone of contention in South America. Antonio Rattin, the Argentina captain, was sent off shortly before half-time. For nothing, is the South American view. And about time too, is the British take. The truth? Yes, he deserved to be sent off. But there were mitigating factors. The main one being that Argentina, who had begun the game in relatively benign fashion, were quite understandably incensed by a dreadful off-the-ball “foul” (king hit, in fact) by the notorious Nobby Stiles midway through the first half. The inept German referee takes no action, and from that point on, it becomes war. Rattin receives a caution for a foul on Bobby Charlton, and far from chastening him, this seems to goad him on to further misdemeanours. He follows up with a nasty tackle from behind on Geoff Hurst, and a spirited protest when another decision goes against Argentina. This may well have been the time for one of his team-mates to gently suggest that he calm down, but clearly it didn’t happen. One more foul given, one more protest, and this time he is dismissed. Unfortunately, the referee subsequently made some foolish remarks about Rattin’s dismissal being the result of “the look in his eye”, which only fanned the flames of suspicion. In reality, by the time Rattin was dismissed, he had richly deserved it. Here, however, is the rub. After the break, England, with a full complement, look pitifully blunt and unimaginative against Argentina’s ten men, and if anything the South Americans appear more likely to score, with the River Plate duo of Ermindo Onega and the young Oscar Mas always dangerous on the break, and the elegant left-back Silvio Marzolini (an early version of Javier Zanetti) wonderfully effective in defence. In addition, the English are hardly angelic in the tackle either: Hurst and Bobby Moore are both guilty of crude challenges on the other fullback Roberto Ferreiro soon after Rattin’s dismissal, both escaping sanction, and in the second half Alan Ball is incredibly lucky to avoid a caution (at least) for a truly awful professional foul on Jose Albrecht when the latter goes on a run upfield. Home-town calls, without doubt, but such is to be expected in a World Cup, up to a point. And none, in truth, were significant enough to really alter the course of the game. When England finally do score, with a cross and a clever near-post header from Hurst, that is clearly that. But they have hardly been the better side. There is, however, one moment of old-fashioned British sportsmanship which is worth noting. With only a few minutes to go, Bobby Charlton is on the end of a vicious foul from Onega, and another Argentinian proceeds to whack the ball into Charlton while he is still on the deck. Sitting on a 1-0 lead, with the clock ticking down, most players would surely milk the double foul for all it was worth. Yet Charlton gets straight back up and continues with the game. Next: England’s semi-final against Portugal, a thrilling game with, again, a hint of controversy. The idea for this book was, and is, excellent. A series of essays, each by a different scribe, and each relating to one of the teams, or rather the countries, that took part at the 2006 World Cup. The aim, one supposes, was to provide outward-looking football fans with a broader taste of the international melting pot on show in Germany. It's refreshing that almost every contributor takes a different line, too. The editors were clearly not after a simple historical overview, or an assessment of a team’s chances. They wanted colour, and by and large they got it. In a sense, this is not even a football book. Many of the essays deal with football only tangentially (if at all), and consequently the collection comes across as half travelogue, half pop cultural analysis. But the mix is generally satisfying, and football is stirred into it often enough to retain the interest of football, erm, tragics. The best of the essays provide a quick, often quirky look at the country and the culture in question while briefly sketching the history of that nation’s engagement with the world game. The grand prize here goes to Jim Frederick’s crisp, engaging and deftly-written piece on Japan; significantly, Frederick is a journalist rather than a trendy novelist (of whom there is something of a surfeit among the contributors). A close runner-up is James Surowiecki’s thoughtful, if grim, account of the Polish national character and how it relates to football. The worst of the pieces take the personal viewpoint to the narcissistic extreme, with the result that essay ends up being about the author, and not much else. The nadir is reached with Saïd Sayrafiezadeh’s eleven-page self-pitying account of his failed attempt to visit Iran (the country he is meant to be writing about). William Finnegan’s tedious tales of surfing adventures in Madeira test the reader’s patience as well, while Tim Adams’ self-indulgent review of his literary trainspotting in Prague is best skipped. Yet the general standard of the writing is high, even if (as with most attempts at cultural analysis via football) the metaphors often induce a cringe. But there are some imaginative means of approaching the material, such as Eric Schlosser’s visit to a Swedish prison, and Alexander Osang’s plaintive account of an East German football fan’s frustrations. A couple of the authors have written about football before, and it is no surprise to find old hands Nick Hornby (England) and Tim Parks (Italy) finding the mark with their dryly witty vignettes. Some of the other contributors, however, clearly don’t know much about the game, and the result is a few factual errors and spelling mistakes, whose removal was probably precluded by the need to rush-release the book prior to the World Cup. The decision to append some of each nation’s vital statistics to each essay – socioeconomic beforehand, football-related afterwards – is an inspired one, and helps to “fill out” some of the brief sketches contained in between. There are more substantial facts ‘n’ figures lists contained in two separate chapters at the end, which are intermittently interesting. 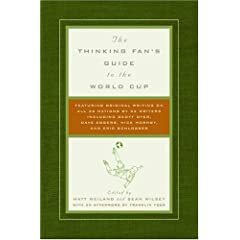 Although both the quality of the essays and their relevance to football varies widely, The Thinking Fan’s Guide to the World Cup is a worthwhile read…even two and a half years past its use-by date. Although Sydney FC retain a mathematical chance of making it to the finals, even their most optimistic supporters would admit that the season is effectively over. It's clearly time to start thinking about rebuilding the team for 2009/10. Last night's performance was, in many ways, typical of the team's efforts in the past few weeks: a lack of real direction in attack, a few bright moments from individual players (notably Alex Brosque and Brendan Gan) but no sustained, cohesive pressure against the opposition goal. And, of course, a painfully uncoordinated and vulnerable defence, with the first goal a comedy of errors and the second bespeaking a lack of both organisation and pace. Whatever John Kosmina's smug truculence towards media and fans, he does deserve sympathy (like Branko Culina and Terry Butcher before him) for the mounting injury list that has plagued Sydney's season. The team would surely have fared far better in recent weeks had Terry McFlynn, Simon Colosimo et al. been available. The mid-season retirement of Tony Popovic, too, was a nail in the knee at such a difficult juncture. But that's the past. Let's look at the future. Some of the players who have underperformed this season, notably Stuart Musialik, Mark Bridge and (of course) John Aloisi, have proved elsewhere that they have plenty to offer when motivated and in the right frame of mind. So there's room for hope there; where the side needs a complete overhaul, however, is at the back. The first urgent need for Sydney FC, which has been blithely ignored for nearly three years, is the acquisition of not one but two proper, genuine fullbacks. Sydney FC fans like yours truly have been tearing their hair out for too long watching converted midfielders or central defenders getting embarrassed by opposition wingers, not providing proper width on the overlap, positioning themselves incorrectly, and so on. Rhyan Grant has looked promising of late, but he is still, like Nick Tsattalios, very young; it would surely be prudent to sign a player of more experience for the role(s). One name that springs to mind immediately is Ben Griffin, out of contract with Queensland at the end of the season (as far as I know), who showed himself a quite capable and versatile performer with the Roar last season. He fits the bill, and he would not be prohibitively expensive. And, of course, there are some good options at state league level as well. The club broke pleasing new ground this season by actually dipping into the local competition for talent, unearthing two good prospects in Shannon Cole and Brendan Gan (and, it must be admitted, a complete dud in Beau Busch). Emmanuel Zunino of Sydney Olympic and Michael Katz of Sutherland, for instance, are two excellent fullbacks who could make the step up to the A-League with little trouble, in my view. With the departure of Popovic, there is also an acute need for a real leader in central defence as well. Poor Iain Fyfe has tried to fulfil this role of late, but he is not quite up to it. Although Simon Colosimo could step into the breach when available again, it would be ideal to retain the option of using him in midfield, where he can also be effective. I'd like to suggest a possibility that may have been forgotten of late, given his limited appearances. He has his deficiencies as a player, but he has the experience and the nous (in my view) required to make him a decent option. What about Paul O'Grady? Under-used at the Mariners, but still perhaps capable of recovering the form of his Parramatta days. And again, he would hardly break the bank. The other lacuna for next season is in the playmaking role, where Steve Corica finally appears to have lost the battle with Father Time. Here is where a shrewdly-chosed South or Central American import might be the best option; I remember suggesting Ariel Ortega as a possibility a couple of years back, but it might be too late by now (he is only a year younger than Corica, after all). But if not, how about Felipe, who made such an excellent impression with Wellington and is apparently keen for a return to the A-League? After my brief foray into the world of football journalism proper, I'm now in a position to be assailing the ether with my opinions and grumbles once more in 2009. And before anything else, I should say: to Martin, Steve, Mark, Jonah and the rest, all the very best for the future. It was great working with you. Whatever the general misgivings about the state of the A-League, 2008 was an absolute peach of a year for Australian football in most respects. A superb start to the 2010 World Cup qualifying campaign, qualification for the Under 20 World Cup in Egypt (a very fine achievement, which didn't really receive the attention it deserved), and, last but not least, Adelaide United's inspired run to the Asian Champions League final. Set against this was the miserable performance by the Olyroos in China, and the general drop-off in both crowds and interest in the A-League. It's nice to see that the quality is undergoing something of an upturn after a wretched start to the season, but there are clearly plenty of issues to be addressed for the 2009/10 season. Herewith, then, some brief jottings on a few of the talking points in Australian and world football over the last seven months; some of my views, I should add, have already appeared on the Real Football website. What a pleasure to finally see a genuinely outstanding side win a major international tournament. Italy in 2006 were smooth and cohesive, the Greeks of 2004 grindingly efficient, and Brazil in 2002 simply a moderately good side who were lucky to avoid all their most dangerous opposition. Spain were a really entertaining, fluent unit who showed that progressive, attacking football could still prevail at the top level. Like all sides of recent years, they had their midfield "enforcer" in the excellent Marcos Senna, but his role was more often creative than destructive. Russia's bright performances against Sweden and Holland, and Turkey's amazing comebacks, were the other undoubted highlights of the event. Germany did well to reach the final, but seemed to lack some of the spark they showed in the 2006 World Cup. Nevertheless, it would take a brave man to write them off as contenders in 2010. Argentina fully deserved to defend their title, although had Nigeria shown a little more coolness in front of goal in the final, they might have pulled off a notable upset. Australia's performance at the event was simply dismal, and for that Graham Arnold deserves a fair chunk of the blame. He has led a charmed life within the national set-up, and although he was to be commended for getting the team that far, his craven tactics and utter lack of faith in his players made a dreadful impression in China. Nikolai Topor-Stanley as a last-minute emergency striker? How Bruce Djite must have laughed. In the women's event, it was a pity to see the scintillating Brazilian team pipped at the post for the second major tournament running. But, in fairness, the US's achievement in taking gold without their major star, striker Abby Wambach, was a fine one. Well, we couldn't have asked for a better start to the final stage of 2010 qualifying, and a place in South Africa now appears within touching distance. Yet, despite the fulsome praise he has been attracting, I have some lingering doubts about Pim Verbeek's acumen. He certainly appears to be a capable organizer (the players appear more comfortable with their roles than was the case under Arnold), and he does his homework on the opposition diligently. But there have been some decidedly odd selections at times (notably Jacob Burns), and I'm not sure that he reacts with sufficient urgency to changing game situations. In Verbeek's defence, however, he has faced plenty of injury problems and often been forced to re-shape his team at short notice, and in that respect he has made a good impression. On the whole, it has been a successful appointment, although the reported salary being collected by Verbeek is a little over the odds, given his relatively limited high-level experience. Who would have thought it? A place in the final in only Australian clubs' second year in the competition, and an appearance at the Club World Cup, in which Adelaide acquitted themselves well (with the exception of that blunt performance against Waitakere United). It was a success built largely on an uncompromising defence, with Sasa Ognenovski very much at the heart of things. Nevertheless, it was good to see other players really grow as the competition wore on, notably Scott Jamieson and (something of a surprise) Fabian Barbiero. Whatever his tactical eccentricities, and he has a few, Aurelio Vidmar deserves to be congratulated for re-modelling the team so quickly and effectively following the off-season loss of Bruce Djite and Nathan Burns...who, sadly, seems to have disappeared without trace at AEK Athens. It started inauspiciously, with a number of turgid, over-physical games, a continued reliance on the long ball by several teams, and not a crowd-pleasing new player in sight. The crowds stayed away in droves, and luckily most teams have heeded the warning signs and opened up their play a little. It's still anyone's premiership at this time, with Adelaide looking in the box seat but facing a gruelling run to the finish in the heat of January. The youth and women's leagues appear to be running smoothly, for which the FFA deserves credit. Attendances are pitiful, of course, but for the ABC to be screening a full match (plus highlights) from the women's competition in their Saturday afternoon slot bodes well for the progress of women's football here. The system of dipping into the youth team for replacements so far hasn't really produced any unexpected stars. Brendan Gan has made an impression with Sydney FC, but although he has shown flashes of real quality, he still looks decidedly raw, especially in his decision-making. In any case, many who witnessed Gan's performances with Sutherland in 2008 were surprised that he was signed to a youth team, rather than a senior, contract. On the subject of Sydney FC (one of my favourite topics, of course), it's hard to say excatly where things have gone wrong. Injuries to Terry McFlynn, Adam Casey, Brendon Santalab and in particular Simon Colosimo have hurt, not to mention the awful form of John Aloisi, but the whole side looks listless and unsure of itself at the moment. It's difficult to pinpoint any specific tactical errors made by John Kosmina, apart from his inadvisable use of Shannon Cole at fullback (which, you could say, was forced upon him by circumstances). But one does wonder whether he has been able to inspire the team sufficiently. It's hard to have too much sympathy for him, either, given his continued arrogance. Although the youth league hasn't yet provided a thrilling new presence for the senior competition, it's good to see that a fair few players have successfully made the step up from the state leagues. Pedj Bojic has been excellent for the Mariners, Adriano Pellegrino has been a revelation over in the west, and even Robbie Younis, who seemed out of his depth initially, has begun to look at home in Adelaide colours. I intend to do plenty of blogging on the NSWPL in the year ahead, and doubtless a few of the relevant names will figure in the 2009/10 A-League season. If the coaches recruit sensibly from the various state leagues, we might just find that this "dilution of the talent pool" argument against expansion is nonsense. And expansion can't come soon enough. One of the main reasons for the drop-off in crowds in 2008/09 has surely been the staleness of the competition, with the same eight teams vying for the four-team finals series, without the worry of relegation. The A-League needs a shot in the arm, and although I'm not sure that two new sides in Queensland is the perfect way to go, it's a lot better than nothing. Is it a wise use of taxpayers' money? I'm not losing much sleep over that one. Ben Buckley et al. have prudently declined to do what they must surely have been tempted to, following the vitriol that accompanied the promise of funds towards the bid by the Rudd government: expose some of the ludicrous uses to which Australian taxpayers' money is being put already. Such is the price of living in a modern pluralist democracy. Yet two wrongs don't make a right, of course, so is it worth it? I think so. Even if the bid flops, the knowledge and contacts gained would be invaluable for a renewed bid in the near future. To the rugby and AFL scribes who have cried poor and indignant, the response should surely be: what goes around, comes around. We are behind the eight-ball in many respects, not least in terms of stadia, but the infrastructure is there and the Australian big-event fever would surely take over from the scepticism should the bid look like succeeding. But it's a very, very long way off yet.